ONE OF THE FOUNDING MOTHERS: Mama Jasiri Neema Kadiri (1949-1996) taught Ile Omode preschoolers from the school's inception until her passing. She was both an inspiration and a treasure. Mama Jasiri's name evokes her signature song, "I Am So Thankful to be African". "It is not who you attend school with but who controls the school you attend." "The function of education, therefore, is to teach one to think intensively and to think critically. But education which stops with efficiency may prove the greatest menace to society." Since 1986 Ile Omode has educated hundreds of children in the regular school program, as well as afterschool, weekend, and summer programs. In 1986, the members of Wo'se Community Church decided that there was a need to develop an independent, African-centered educational institution in Oakland, California. Members were concerned with the mis-education and the culturally and spiritually deficient education imposed on African and African American youth in the public schools. At our school's first site in 1986. The members of Wo'se Community Church established Ile Omode as a manifestation of kujichagulia, self-determination. As Dr. Maulana Karenga reminds us that kujichagulia requires that communities, "determine their own destiny", and thus take responsibility for changing their conditions. Ile Omode are words of the Yoruba people of West Africa. Together, they mean "House of the Children". Children are obviously essential to a school, but the name recognizes that we exist so that they may be served. Our school is designed to educate and train our young people to become outstanding leaders and workers for our people. Ile Omode began its formal educational program in 1986 as a licensed preschool with offerings for kindergarten children as well. The founders and first teachers were Oluri Oyin, Okanona Ka Kalungu, and Jasiri Neema Kadiri. 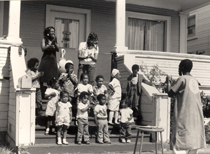 The school began at Mama Olyin's home on 54th Street in Oakland, before moving to the present address at 8924 Holly Street in 1988. Mama Okanona served as the first director, and the school began with fewer than a dozen students, many of whom were children of Wo'se families. 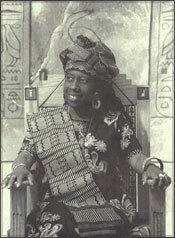 Mama Jasiri served as one of the early directors of the preschool, and joined the ancestors in 1996. After her passing the preschool was renamed in her honor to the "Mama Jasiri Preschool". To honor our historic ancestors, each classroom is named after an ancestor, and classroom names include, "Marcus Garvey", "Malcolm X", "Frederick Douglass", "John Coltrane", "Ngola Nzingha", "Zora Neale Hurston", and "Harriet Tubman". In September 1989 Ile Omode was recognized by the State of California as a private school. In 1991 a first grade was added, and administrators continued to add additional grades throughout the 1990s, and by the late nineties the school had added grades 1st through 6th. Finally, in 2008 a middle school was added. The school presently offers a preschool, elementary, and middle school program. 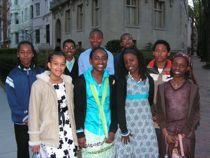 9 middle school students toured DC in 2009. In 2010, a partnership with a local community college allowed our advanced students to concurrently enroll in an advanced math course, and Bakare Awakoaiye was the first Ile Omode student to complete a college course, while in the 8th grade. Since then several students have completed courses at the college, and every student earned an "A" in the course. Adrien Herron was the school's first 8th grade graduate in 2009, and since then, Ile Omode generally graduates approximately 5 to 7 students a year. One of the middle school's unique offerings is the out-of-state college tour. The tours were one of the director's vision, and Baba Jahi Awakoaiye began the first tour in 2009, when 9 Ile Omode middle school students took a week-long trip to Washington, DC. Five of the students from the inaugural group were later accepted to Howard University in high school, and two of the students attended Howard University. During our history, we have served hundreds of children and their families.